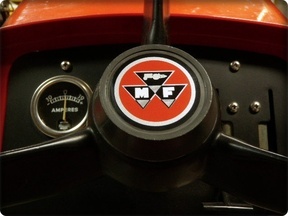 Reproduction direct fit part for 1960's-1970's Massey Ferguson Lawn and Garden Tractors. Molded from high grade plastic resins with cast-in metal mounting studs. Red prime painted and ready for finish coat. 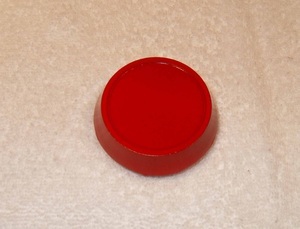 Red rouge finish painted and ready for installation. Reproduction direct fit part for all Massey Ferguson lawn and garden tractors from the 1960s-1970s with the Ross Steering column such as Models 7, 8, 10, 12, 14, 16, and the later Models 1200, 1400, 1450, 1600, 1650, 1655, 1855. Beveled style: Matches original caps for early Model 7, 10, and 12 up to around 1967. Will fit models listed above. 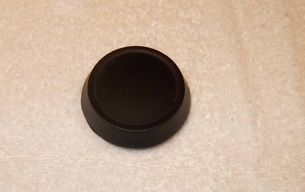 Black finish painted and ready for installation. Beveled style: Matches profile of original caps for early Model 7, 10, and 12 up to around 1967. Reproduction vinyl decal printed on high performance material which is especially suited for outdoor applications. Decals are "die cut" and sandwiched between backing paper and application tape. When applied, these decals leave no clear plastic film giving your restoration project the best possible finish. Fits the above caps, original stock caps and just about any other place you may want to put one.